How do you make time to work out? Before Alex, I used to work out at lunch, but now that I'm always eager to shorten my workday as much as possible, I can't conceive of spending an hour over lunch working out. In the morning, I already barely have time to get dressed, eat breakfast, and spend a little quality time with Alex, and I can't imagine fitting a workout in there, either. After Alex goes to bed, it's pretty late. I'm exhausted, and that's my only time to catch up on personal stuff...and as it is I'm already not clearing my to-do list. To try to squeeze in another to-do during that time period seems like it would just doom me to never catch up. I've tried taking Alex for walks in the morning or right after work, and while that's better than no physical activity, it doesn't give one the same physical satisfaction as a real aerobic workout. I don't know how many working moms actually read this blog, but I'm really dying to know if I stand any chance in hell of getting back into shape. If only exercise were as easy as blogging, I could do one mega-workout at midnight on Sunday and catch up for the whole week prior. This afternoon, we had a quiet spell. Nick and my mom were napping (having both taken early shifts with Alex when he woke up brimming with energy at 7am, while I got to sleep in). I was in the family room with Alex. He was playing quietly with a variety of toys while I was reading a magazine. Every once in a while, he'd come over to the chair where I was sitting, and just start crawling up onto me. He would climb up the chair, and sort of clamber up to the back of the chair, not letting me get in his way in the slightest. Getting to the top, where he could reach over the back of the chair and sort of bat at the wall behind it, made him so happy. He'd smile and laugh (with his 8 teeth, he has a very cute smile right now) and bat at the wall a bit. Then he'd sort of clamber back down (he's learned to get himself down from chairs, beds, and sofas now--a very valuable skill) and go back to his books, drum, and blocks. He does this early in the morning, too, when I'm sitting in the glider in his room trying desperately to catch a few more winks before facing the fact that Alex is, in no way, going to go back to sleep. He'll climb up and try to grab the curtain behind the glider, with a huge, happy grin and some cute gurgles. I mean, this is true minutiae, and that's perhaps why I wanted to write about it. I just loved getting climbed over by my little squirmy baby, and I love how such a simple feat causes him such joy. The couple bought for $424,000. They're disappointed that the listing price is $858,000. They bought in 2002. Poor saps... only making about 400 grand in 5 years. What did they expect? The article states that the owners have an "old world" ethic of keeping a home in the family for generations, and it supports this with a sappy quote from the owner about defending his turf. Unfortunately, the article says, the bad job situation in the Bay Area is forcing them to abandon hope and move to Arizona. Except earlier in the article, it states that the owners investigated selling a year ago, but decided to wait. Now they're disappointed the recommended asking price has gone down. If they're so committed to defending their turf, why were they thinking of moving last year? These people bought in a subdivision, and made all sorts of non-traditional modifications to their house. Even though they'll be doubling their money over 5 years, they "barely break even" because of all the money they put into it. Especially because several identical homes without the weird modifications are also for sale in the same 'hood, for less money. Why does this all bug me so much? This article should have had the headline along the lines of "UNWISE REAL ESTATE SPECULATORS GET COMEUPPANCE AS MARKET CORRECTS." From what I could tell, those are the facts of the article. These poor people bought a dime-a-dozen tract house at a time when they lacked job stability; remodelled in a short-sighted manner and with an extravagant budget; and have unrealistic expectations of the profit they should be making on their house, which they didn't really seem to think of as a home but was more of an investment, and an unwise one at that. It just bugs me that, in wrongly labelling a true (and badly edited) story, they are in effect telling lies. OK, maybe I'm ranting now. It's late and I haven't been editing this post too closely. Good night. I'm very excited to hear that they're making a new movie of Brideshead Revisited. I loved this book, and the miniseries starring Jeremy Irons was beautiful, too. Having spent part of my junior year studying at Oxford, I had a special appreciation for the story, which is partially set there. If you haven't read it, it's amazing, especially if you have any Anglophile tendencies. The movie is going to star Emma Thompson and relative unknowns as Charles Ryder and Sebastian. I hope it's good. We celebrated Alex's birthday today. We didn't make a big deal out of it, just inviting over some friends and family members. I did, however, indulge myself by catering the party from Bi-Rite Market. I kept calling it my working mom's "bonus," but it was more of a necessity; there was no way I would have been able to make food for the party without cracking. I also requested that our cleaning lady come on Friday, so that the house would be maximally clean for the event. Other than that, I tried really hard not to overdo preparations and worry. Sure, we took some junk down to the garage and hung some long-neglected pictures on the wall (you wouldn't know we've been in the house almost two years from the largely bare walls). But I really wanted this party to be a fun, relaxed affair and not send me into the tizzy it so easily could have. Paper plates, email invitations, no gifts, minor decorations...it was all pretty low-key. And thanks to my great team, the party was AWESOME! My dad brought har gow (dim sum shrimp dumplings), chow mein, and champagne to round out the catered menu of chicken satay, mozzarella & tomato skewers, and spinach and pear salad. My mom supplied flowers, mini pumpkins, and a bunch of art supplies that the kids used to decorate the pumpkins. (I had wanted biodegradable party favors but hadn't had time to shop for any--the pumpkins were perfect. The kids each took home their decorated pumpkins...) Nick was on hand to do my general bidding (which is a lot harder than it sounds). And Alex was amazing. He napped from 11:30 to 1pm, waking up just in time for people to arrive. He really, really enjoyed spending time with his cousins, especially Thomas, whom Alex followed around all afternoon with an obvious reverence. 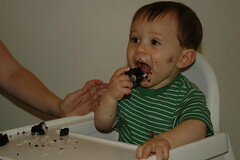 He loved his midnight chocolate cake with cream cheese frosting. The cake was excellent, but incredibly dense, and the sugar kept him going until he had massive bags under his eyes around 4pm, when people were starting to leave. When I put him in his room, I don't think he knew what hit him. He laughed as I took off his socks and shoes and drew the shades. He was cooing and still giggling as I nursed him briefly and set him in his crib. He hopped right up to standing and smiled at me wildly as I closed the door. I expected to hear wailing, but he was silent for the next two and a half hours. Nick has declared every Sunday during this football season "Patriot Sunday." 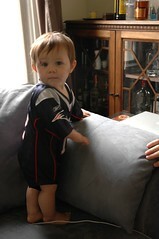 We've all got New England Patriots (Tom Brady, #12, to be exact) jerseys that we're required to wear during the games. Last year at this time, Alex was still in the womb for the season opener. This year, he watched the first part and slept through the last hour. We had a great time. It helped that the Patriots seem unstoppable this year. I can't believe Nick has turned me into a football fan. I actually knew why it was such a big deal for the Patriots to have snagged Randy Moss before I saw Moss catch a couple amazing passes today. Nick and I are even planning to play Madden NFL 08 together. We'll see how that goes; I wouldn't agree to it if I didn't already know that Nick's not all that great at Madden. I just wish he'd let me play the Pats, because they're supposedly hard to beat in the game, but he's not that much of a gentleman. He suggested I play the Colts! They've struck again. Our next-door neighbors installed a gorgeous flower box. I'd noticed that the flowers had survived about a week. Then the evil flower thieves struck. I loved the note our neighbor stuck to their gate--so wonderfully pithy. Tutu and I got season tickets to ACT, and we attended our first play this Saturday, Sweeney Todd. I'm not a huge fan of musicals, so I was a little uncertain that I'd enjoy it, but it turned out to be so gruesome and dark that I think it was a great introduction to Stephen Sondheim. The lyrics were fantastic. I can't wait to check out his other work. I really liked the music, all minor keys and discordant. The play's themes were sad and relatable--love, loss, desperation, greed, vengeance. I loved the set, which consisted of a black coffin in the middle that was used alternately as a table, a counter, a coffin, or just a platform on which the actors stood; a bunch of chairs; a row of coat racks, upon which hung several aprons and lab coats; and a large wall of shelves that held a bunch of knick knacks related to the play (the tools that Mrs. Lovett, the piemaker, uses for her nefarious tasks, for example). The entire set and wardrobe used only black, white, red, and the occasional grey or neutral. I really liked the art direction. I guess my only complaints are that not all the actors enunciated well, so I had some trouble understanding entire characters' purposes (Tobias), and I didn't really know why certain of them were there until it became totally obvious (Beadle). I also found the murder scenes, though done extremely subtly, went on too long. It was like, I get the point already! Also, the play was generally depressing.... For instance, I hated when, at the end, they pointed to random people in the audience, questioning whether the person sitting next to you might be a depraved murderer, driven to it by circumstance. 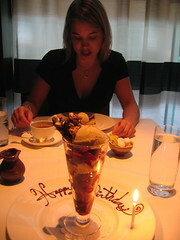 It was my birthday recently, and my dear friend Sari took me out to dinner at Ame. She didn't even mention to them that it was a special occasion, but they must have heard her wish me a happy birthday upon my arrival because my dessert arrived with this beautifully minimal flourish. My other favorite part of the meal was the stiff lime and liquor libation she'd ordered for me that was on the table awaiting me as I walked in, 30 minutes late. (My cab never showed up and I'd had to hail one after waiting 20 minutes.) Thanks, Sari. You're the best!